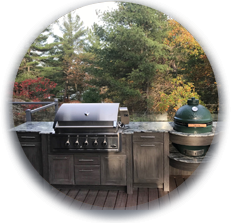 If you enjoy cooking and entertaining, creating your own customized, outdoor kitchen is a wonderful way to enhance these moments. 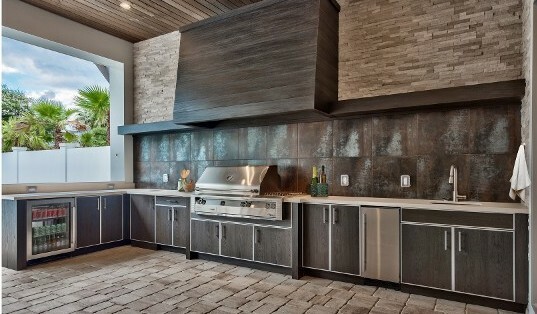 Outdoor Kitchens eliminate seafood and smoke odors in the house and keep your utility bill lower. 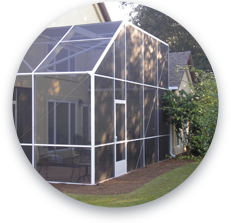 We also offer gazebo, pergola, and custom overhead structures to keep you safe from inclement weather. 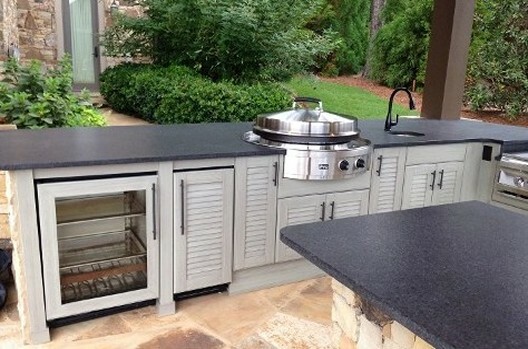 Customization of your outdoor kitchen includes, but is not limited to: grills, pizza ovens, side burners, sinks, cabinetry, wet bars, cooler drawers, granite counter tops, fire pits, custom masonry, paving stones, decks, pergolas, screen and pool enclosures, retractable screens and awnings, and outdoor living areas. Stop by our showroom to view sample products and speak to one of our professional designers, or call 251-968-9777 today to schedule your free, on-site consultation. We offer several lines of top-rated grills and cooking accessories. Including but not limited to Blaze, Napoleon, Luxor, and Lynx with Sedona. These high-end outdoor cooking products offer quality features such as ceramic burners, infrared technology, and Smartgrill technology - so that you get the perfect meal every time! 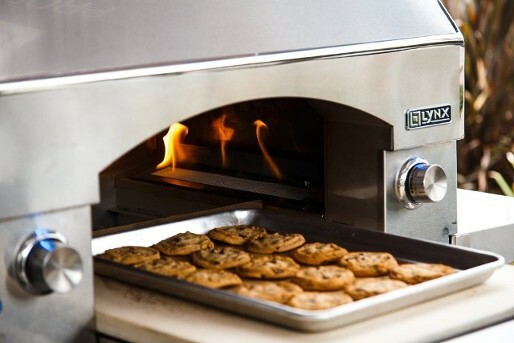 Customize your outdoor kitchen with the Napoli outdoor oven, smoker box, warming drawers, side burners or an Asado cooktop so that you will have the outdoor cooking experience of your dreams. As the host do not step away from the action. Incorporate an outdoor sink to allow quick access for rinsing, filling, or washing items as needed. You can even upgrade the sink area with a beverage center, which offers not only the sink but also: bottle storage, bottle openers, an ice bin with garnish containers, and an over the sink cutting board for drink garnishments. End the cooler clutter by equipping your outdoor kitchen with a refrigerator, or a cooler drawer, which holds ice and beverages that neatly tuck away until desired. Outdoor kitchens are a great way to add function to your outdoor lounging or dining space. 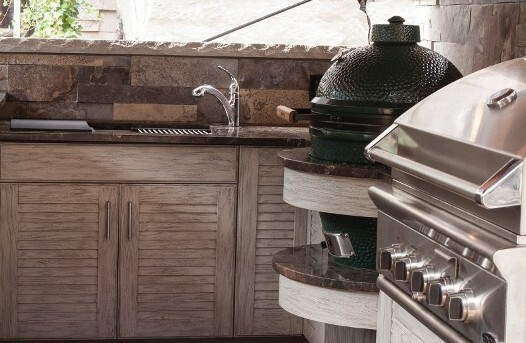 We offer several styles and finishes of outdoor kitchens to complement your personal style and needs. Built to last with our beautiful water and fade proof cabinetry. Luxurious wood finish that thrives outdoors. Imagine… wood that won’t warp, fade or crack! 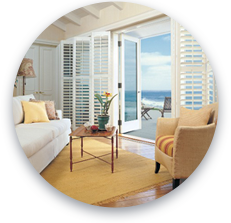 Distinctive finishes include contempo, louver, shaker, and slab door styles available in 19 color options. 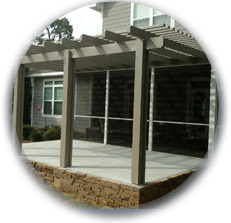 Complete the look with our water proof composite finishes including: ship lap, wood panels, brick, stone, and stacked stone. 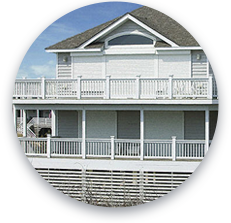 We offer a full line of cabinetry to seamlessly integrate with your existing Trek decking. Organization is a breeze when you include our lazy susan, pan divider, and cooler drawers. Entertaining is relaxed when your outdoor kitchen keeps necessary utensils quick at hand. Custom design options will help you create your ideal cooking experience.Complete with warming drawers, benches, hide away waste baskets, cooler slides, and wall mounted t.v. cabinets. 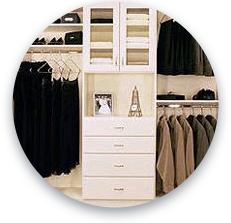 Our Cabinet systems offer an unsurpassed durability that will preserve their beauty for years to come. Beautiful and versatile granite countertops take any outdoor living space or home improvement project to the next level! This sanitary option withstands the wear and tear of cooking with legendary durability. Customize your outdoor living space with the feel of elegant countertops that will not fade. 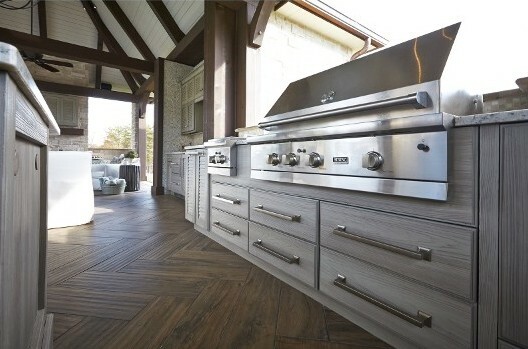 We have a broad variety of colors, styles, and patterns that allow you to create your dream outdoor kitchen.